Allan Townsend made 190 appearances for Gloucester at tight head prop forward between 1959 and 1964, having already played once for the club in September 1956. He was club captain in 1961-62. He also played for Cheltenham from 1951-59 (captain 1957-59), Aldershot Services, Bournemouth (captain 1967-68), Bath United (captain 1969-70) and Frome. His county caps included a semi-final against Lancashire in 1964. Allan Townsend was born in Cheltenham in 1933 and was educated at Cheltenham Grammar School, where he played for the 1st XV and for Gloucestershire Schoolboys. On leaving school in 1949 he became an employee of Martins’ Bank in Cheltenham and joined Cheltenham RFC. 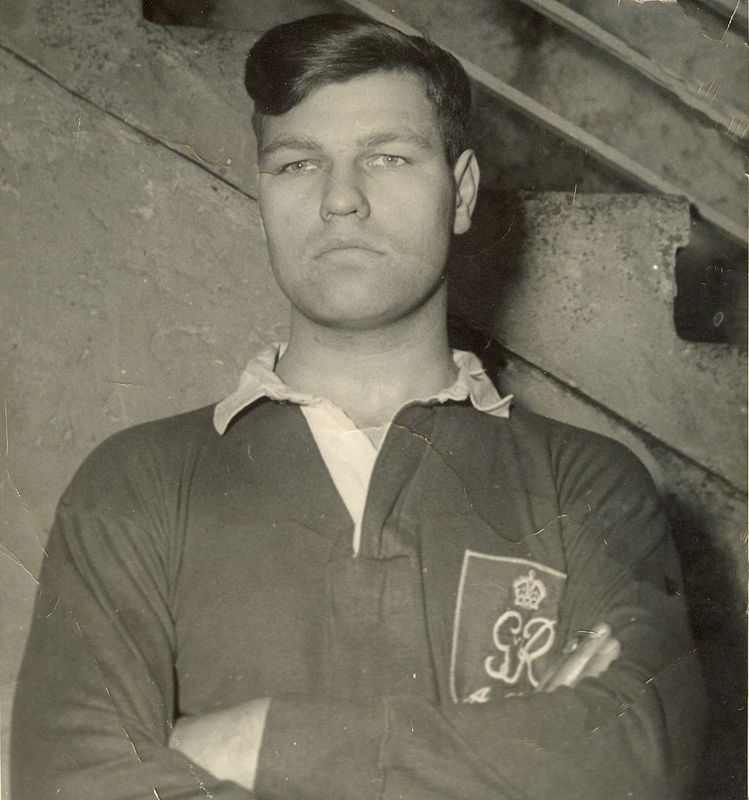 He made his 1st XV debut in 1950-51, standing in for Tom Price. On call up for National Service, he joined the RASC and was stationed at Aldershot where he played for Aldershot Services with M J K “Mike” Smith the England outside half and test cricket captain and John Currie the England lock. He toured Germany with an Army trial side and played against BAOR in Berlin. He returned to Cheltenham after National Service and in April 1954 played at Kingsholm in Cheltenham’s first win on the ground for 24 years. The following year he played for Gloucestershire against British Police at Cheltenham and went on to play in all three South West group matches that season. Unable to get back in the county side, he joined Gloucester in September 1956 and after one game for Gloucester United (at Bream, winning 72-0) he played for Gloucester against a touring Romania XV at Kingsholm. However, he was not picked again that month and after enquiries from the Cheltenham club it was agreed that he should return to Cheltenham in early October. Allan continued to play regularly for Cheltenham for the next three seasons and became captain in 1957-5 and 1958-59. Allan Townsend made his return for Gloucester against Lydney at Kingsholm on 12 September 1959 and was a first choice for the next five seasons. He played throughout the record breaking sequence of 13 wins between October 1959 and January 1960 and the following year was picked again for the county against Yorkshire at Cheltenham. The County Championship semi-final against Lancashire at Bristol in 1964 was Allan Townsend’s final county game. Gloucestershire lost despite a dominant performance by the pack. He retired from 1st XV rugby on the last day of the season against Stroud, a match in which he scored one of his five tries for Gloucester. In 1964-65 he captained Gloucester United. Career moves took Allan to Bournemouth where he captained the club in 1967-68, Bath where he captained Bath United in 1969-70 and finally to Frome where he was both player and administrator. On his return to the area, he joined the Gloucester committee, where he served from 1983-96, was a member of the Gloucestershire Committee for 18 years and a member of the RFU Committee from 1991-97. Allan Townsend has been President of Gloucester RFC since 2008.